You've finally finished installing your outdoor landscape lighting and now you can sit back and enjoy the peace and beauty your landscape has always possessed, day and night. Unfortunately most people are not home to enjoy it throughout the day. 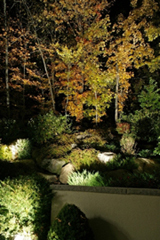 Accent your landscape with beautifully designed landscape lighting. 8 Ways Landscape Lighting Can Enhance The Beauty Of Your Home. Steer attention away from parts of your landscape that are not so appealing. Make your landscape look larger than it really is. Bring your exterior space inside the home, making your interior seem larger and more expansive. Make your plants and floral arrangements more inviting with outdoor garden lighting. Help steer away potentially unwanted house guests. Make hosting a party at night much more of an event. Create a sense of peace in the souls of your guests by highlighting nature's beauty. Use it to safely guide people through your yard and help avoid possible injury. Now that we've had a healthy dose of daydreaming lets get back to planet earth and get this landscape lit like a pro. So you don't know where to start? Thats normal but outdoor landscape lighting does not have to be complicated. Lets remember to keep it simple and work with what we got, so lets start from the end. Envision your landscape exactly the way you want it to look at the end of the project. Take note of all that you want people to notice and highlight it in your head. Is there a beautiful tree that needs to be glorified? Outdoor tree lighting can make it look more magical. How about a sculpture or fountain that deserves attention? The easiest time to plan your outdoor lighting design is before you even start construction. If ripping everything out and starting from scratch is your cup of tea, better yet. Brainstorm, think about what you love about your landscape and what you could do without. Where do I want to draw people's attention? Is there a primary function that regularly takes place here? Is there a change in elevation? What type of soil am I dealing with? Clay, silt, sand or a combination of any of these? Is there an underground sprinkler system installed? If so, where is it located? Where is the main electrical source located? What existing structures can I use to hide lighting fixtures? Will you be running Line Voltage or Low Voltage lighting? Line voltage means that you will be running 120 volts or normal house current. Sometimes you can work with both systems, but if you have a Line Voltage system, you can use it to power multiple low voltage components. In order to do so, you would need to install a low voltage transformer. No, not the popular cartoon. A transformer is used to change or transform the line voltage (120 volts) to low voltage (50 volts or less). Don't feel overwhelmed, an easy outdoor lighting solution to the is simply to install solar outdoor lighting. Its easy to install and requires hardly any maintenance.Choose from a variety of solar garden light fixtures when designing your garden. Solar outdoor lighting can be incorporated with landscaping that helps a home be more energy efficient and attractive at the same time. There are landscaping designing tips that show you how to achieve this by using shrubs, ground covers and trees in strategic locations on your property to create micro climates around the home. Thus helping you save energy, add beauty, and increasing the value of your home. No matter which way you go, outdoor landscape lighting plays an important role in your outdoor environment. How you plan your lighting will determine how people decide to use your outdoor space.